Physician Landry Dongmo Tsague 07MPH was halfway around the world from his home in Cameroon, studying at the Rollins School of Public Health as a William H. Foege Fellow in Global Health, when a good friend proposed the improbable: that in their spare time, the two men should create an open source medical journal for African scientists. "At the time I was fine-tuning my skills in research, documentation, and scientific writing at Emory," remembers Tsague. "I paused and said, 'You're right. Let's do it.'" That was 10 years ago. Now, the Pan-African Medical Journal (PAMJ) is an established, credible open-source online resource for scientists in and out of Africa. It has multiple offices; it has bilingual editors and article reviewers; it has an average of 15,000 unique visitors per month reading its more than 3,300 articles; and, most important to Tsague, it has an earned a reputation for publishing high-quality research by and for African scientists. For Tsague, founding the Pan-African Medical Journal was an important milestone in a career that was already full of accomplishments. Before becoming a Foege Fellow at Emory, Tsague was directing efforts to reduce mother-to-child transmission of HIV for the Cameroonian Ministry of Public Health. That work had led to being honored with an International AIDS Society Young Investigator Award. In addition to his education as a medical doctor, Tsague had also completed additional training in clinical research in France and in applied health informatics and statistics in Benin. Still, Tsague and other accomplished African colleagues struggled to get their work published by established medical journals. Tsague says many journals weren't interested in the work he and his colleagues were doing in Africa, despite its relevance to African scientists and doctors. Article submission fees to journals made publication beyond some African scientists' reach. "Even as an African medical student, I could see the missed opportunities that our generation and the generation before us had faced to make our work known by the global health community and to make our work used for global health," says Tsague. "From the start, our mission was to foster, stimulate, and perpetuate a culture of information sharing and publishing amongst researchers and other health care actors in the African health scene." So in between classes at Emory, Tsague and his friend Raoul Kamadjeu (then a fellow at the CDC) began brainstorming how their journal would be different. "We started open access because we wanted to solve a problem linked to the availability of published work by Africans to the African community of scientists," says Tsague. "We wanted to expand the options of African researchers by providing them with a journal of continental scope so they could become major contributors to indexed medical literature." By existing entirely online, they hoped PAMJ would ensure that relevant research could be used immediately by scientists around the continent, without waiting for print publication and mailing. Tsague found his position at Emory—specifically as a Foege Fellow—essential to the upstart journal. "We knew for the journal to fly, we needed globally accepted leaders in the field who could back us up," Tsague says. "The most significant impact of the Foege fellowship has been and continues to be the invaluable professional and personal connections with public health experts from government, private sector, and academia in the United States and around the world." After finishing his MPH at Rollins, Tsague went back to working in HIV/AIDS prevention and treatment in Africa even as PAMJ was first coming online. And as African scientists' internet searches began leading them to PAMJ, Tsague's personal connections led to a partnership with AFENET, the African Field Epidemiology Network. AFENET now provides office space, equipment, and funding for PAMJ editors in Uganda. In the past few years, PAMJ has also added one editorial office in Cameroon with six full-time editors to keep up with the growing number of articles submitted in the French language. Meanwhile, PAMJ's slim budget is based only on a submission fee of $180 for scientists submitting articles. Tsague is now based in Dakar, Senegal, and rejoices in what his journal has accomplished. "Even in Eritrea, even in Sudan, even in Libya, people are accessing the journal and submitting articles for publishing," he says. 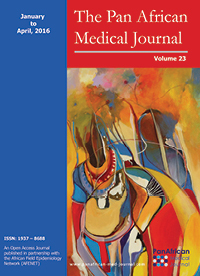 According to Google Scholar, PAMJ is now the second most influential open access medical journal in Africa. Still, Tsague's work is not done. "What is critical to insist on is the journal surviving its founding fathers," he says. After all, Tsague still has other professional ambitions, including finishing a PhD in public health and excelling at his day job as a senior HIV/AIDS specialist for UNICEF. "Making a significant contribution toward ending the AIDS epidemic in Africa during my lifetime has remained my personal aspiration —a commitment that was nurtured during my time at Rollins," he says. And if work published in PAMJ can help the AIDS epidemic end more quickly, then that will make all his hard work after hours worthwhile.